My loves and I are fond of the occasional game of Scrabble. We recently acquired the version called Super Scrabble and played it for the first time tonight. The thing about Super Scrabble is the board is bigger and there are more letters – and more bonus squares (including the wonderful Quadruple word and letter squares). This allowed me to do something rather splendid. I put down a seven letter word (‘candles’) on two Triple Word Score squares – giving nine times the word total. Between that and the nearby word with a Z in it (which then became another triple-word-score word) I managed a nice total. One hundred and eighty three points in a single move. Finished the game with 465 points. I swear, the second I realised I could make that move was as pure a high as I’ve ever known. 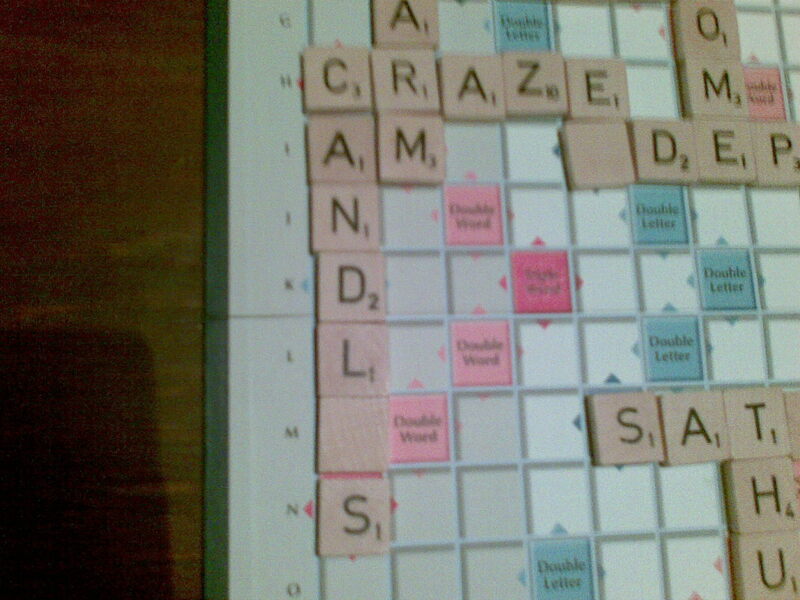 Scrabblegasm. I found it in this fine article about nelogisms and the silliness of overly-rigid definitions of what is and is not a ‘real’ word, written by lexiconographer Erin McKean. It was described over at Boing Boing as being about ‘English as a user-modifiable technology’, which is a lovely concept… though not one explicated in the original article. Oh… and interrobang means ‘a combination of the exclamation point and the question mark’. The title of this post, if you haven’t already got the joke, refers to this piece by Aleister Crowley. There’s a Guttershaman piece coming soon on the small problem of ‘authenticity’ in magical systems and belief systems in general. I’m still chewing that one over, as I don’t want to insult or belittle too many people at once… but at the same time I have a need to point out a few holes in the whole concept of authenticity, with a little help from my friends such as Doktor Sleepless. The Virtuous Well or St Anne’s Well is a Christianised well almost certainly built over a Celtic sacred spring. It’s a lovely place; it’s in a field just off a country road but it feels about a million miles from anywhere. You can walk down into the well and sit on little stone seats while you soak up the atmosphere. There are little alcoves where you can leave offerings – on the first visit I picked buttercups from the field, this time we brought sweet peas from our garden. The water contains iron, which may be responsible for its reputed medicinal qualities. The water was thought to be especially good for ‘complaints particular to women’, which would make sense if the woman in question was anaemic from endless pregnancies and breastfeeding. 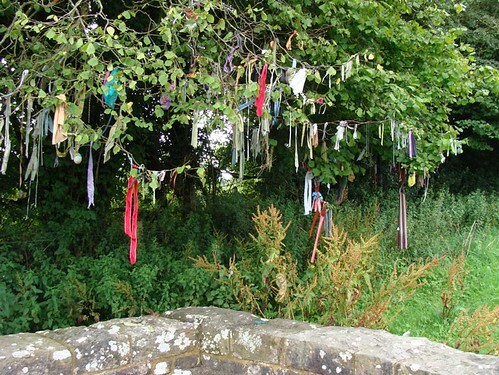 Above the well, people have festooned a tree with fabric offerings. 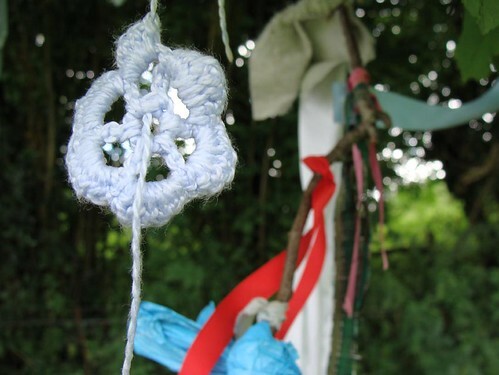 This is a very old British custom: tying pieces of cloth called clooties or clouties onto trees beside sacred wells is believed to have Celtic origins. 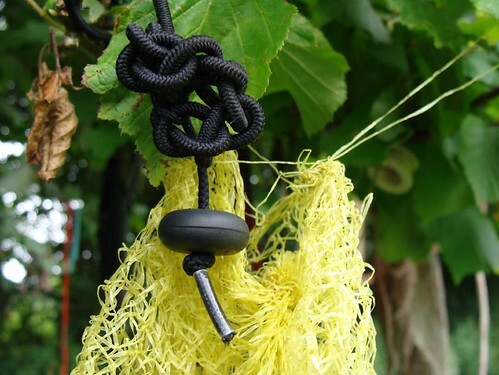 Originally people would leave pieces of clothing that had been soaked in the well water in the belief that their ailment would pass from them as the cloth rotted. These days, a more eclectic variety of (mostly) fabric offerings are left. 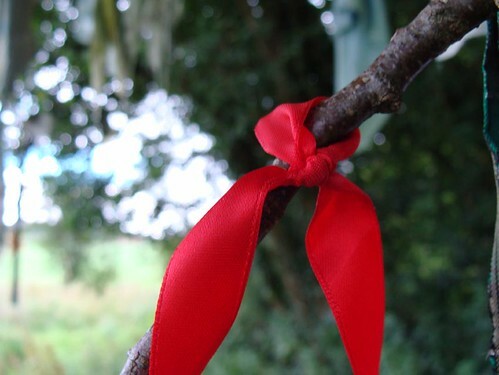 I noted a plethora of ribbons and strips of torn cloth interspersed with more unusual items including scarves; a pair of underpants; socks; a martial arts belt; a ceramic medallion; hollow blown eggs; a hand-crocheted flower; numerous hair decorations; strings of beads; shoelaces; knotted plastic bags; the remnants of a balloon; bright yellow fruit netting; a Tibetan prayer flag and even a cuddly toy. They were all knotted and tied together in what I felt was a genuine outpouring of decorative and sacred expression. I read one review of the well that decried the modern cloutie rags because some of the fabric is man-made. But I loved them all. There’s a raw honesty to this sort of spontaneous folk installation that I find very appealing. While it might be better if people thought ahead and brought biodegradable offerings, I love that people aren’t constrained by what might be thought as proper but instead offer the item that they are moved to leave. 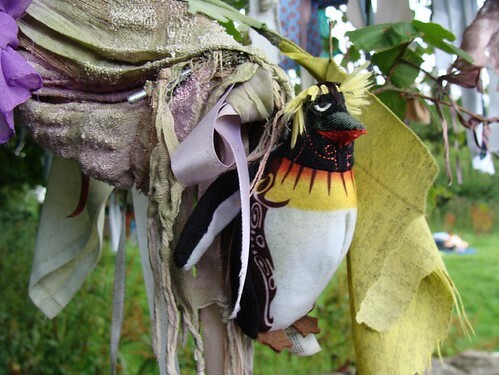 While many of the offerings have obviously been deliberately chosen, I suspect that many people find the well by accident and leave what they have on them in an instinctive response to the existing offerings. It certainly explains the hair ties and beads. And really, who cares if it isn’t ‘authentic’? It’s far more important to me that this place is still in ceremonial use. And who gets to define authenticity anyway? Perhaps the person leaving a sock was genuinely trying to heal their foot? 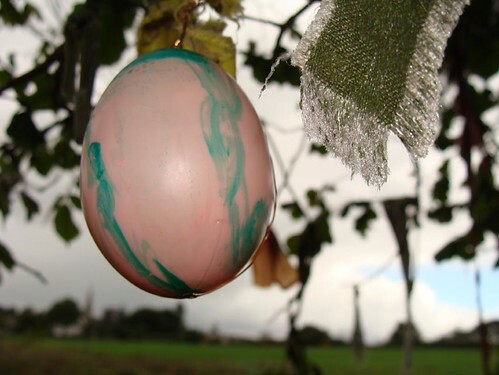 Perhaps the grimy, slowly rotting underpants were originally part of a fertility ritual! There was no graffiti on or near the well and there was no rubbish lying around. Everything that had been left had been done so neatly, carefully and reverently. Sure, some of the offerings could be seen as irreverent but the way they were placed suggested that they weren’t. Surely authenticity isn’t something that’s set in stone but is, instead, a reflection of what people actually do. That question of the Authentic isn’t an easy one to examine – but look out for future posts trying to get a handle on it. You are currently browsing the Cat Vincent's Oddities and Mutterings blog archives for August, 2008.